Rocio grew up on the U.S.-Mexican border as the youngest of five children. After later having a child of her own, she began attending Plano Family Literacy School (PFLS), a local partner of the National Center for Families Learning (NCFL). There, Rocio continued her own education while learning how to become more involved in her children’s schooling as well. She was invited to share her family literacy story at the 2018 Families Learning Conference. 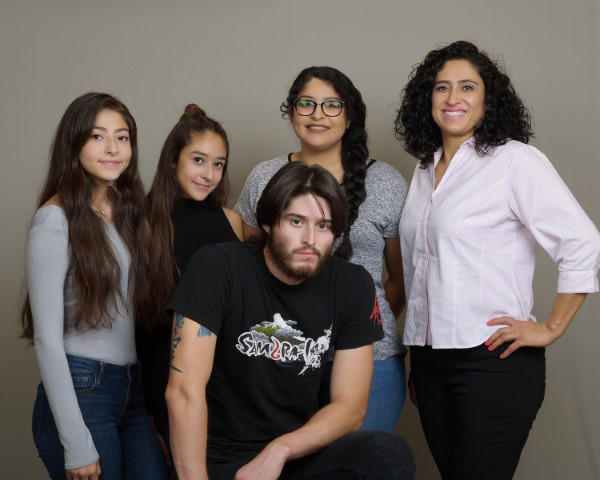 After leaving her village in northern Mexico for Dallas, Texas, Rocio struggled with transitioning to life in the U.S. Once she found the Plano Family Literacy School (PLFS), however, everything changed for the better – both for her and her children. Growing up in the tiny Mexican village of San Jeronimo de Sauces in the northern state of Zapatecas, Rocio had a burning desire to read anything she could get her hands on; unfortunately, there was no library in her village. She remembered having access to a single book in her home: a thick Bible, with a red-wine colored cover and thin pages. “When I learned to read, I devoted myself to any book I could find. I wished I could have [had] access to more children's books,” she recalled. Living with her mother and four siblings in an adobe home with a kitchen and three bedrooms, Rocio experienced good times with her family in San Jeronimo de Sauces, but daily struggles as well. Since her father worked on long-term construction projects in the U.S. and was gone for months at a time, her mother did her best to take care of the five children. Rocio remembers particular times of scarcity, especially as it related to meals. From afar, Rocio’s father encouraged his children to pursue education, a fairly rare sentiment in a place where many children did not continue with schooling beyond twelve years of age. Though her siblings chose a different path, Rocio was eager to learn. With her father’s blessing, she defied the norm. “I didn’t want to stop; I wanted to keep going,” she said, and walked 30 minutes each way to the secondary school in San Antonio del Cerrito. Despite these efforts, her educational journey was eventually postponed. After marrying her boyfriend Pascual at age 19, Rocio and her new husband moved to Dallas in order for him to gain employment in the construction industry. Upon arriving in Dallas in 1994, the couple moved into a modern apartment rented by his siblings. Though the beauty of illuminated buildings reaching towards the sky in downtown Dallas provided a sharp contrast to candlelit evenings in San Jeronimo de Sauces, Rocio soon found herself overwhelmed and lonely. Pregnant with her first son, she couldn’t speak English and was unable to recommit to her own education. Once her son was born, changing her circumstances seemed to become more difficult than ever. Years passed, and in 2000, Rocio and her husband purchased a home in nearby Plano. Rocio’s brother had told her the area was home to high-quality schools; at this point, the couple had two children with a third on the way. Soon after she moved, Rocio learned about the Plano Family Literacy School (PFLS), a local partner of the National Center for Families Learning (NCFL). The school offers evidence-based, two-generation interactive literacy activities for parents and their children. Rocio was able to attend with all three of her children. Rocio with her children (clockwise from top left), Emily, Heidi, Kim, and Kevin. Rocio participated in NCFL’s Parent and Child Together (PACT) TimeⓇ for four hours a week. “I learned to talk with [my children]; to sit and play with them more often,” she said, adding that through programming and activities, she also learned about positively engaging in her children’s school. “I learned about the importance of meeting the teachers of my kids, attending parent-teacher conferences, and volunteering at school.” Confidently, she began to navigate the school system. Before learning how to advocate for her children’s education and productively support their schooling, Rocio said she had only a vague understanding of how to go about being her children’s first and most important teacher. Rocio eventually honed her English and academic skills and earned her GED®. In 2003, she was offered a position as an Early Childhood Assistant at PFLS, her first job since arriving in the U.S. Securing the position made Rocio feel that she was contributing to the economy, giving back to the program that supported her, and as a bonus, she worked under the same roof as her children. “If I had gone to work somewhere else, I wouldn't be able to stay with my children and see them and guide them,” she said. Rocio also modeled advanced academic attainment for her family, enrolling at Collin Community College in the summer of 2009. Being back in a traditional classroom wasn’t easy. She recalled the first day of her English rhetoric course. “It was a frightening moment. On the first day of class, I sat in the last row. I was very nervous,” she said. “I felt intimidated for a long time,” but her comfort level and confidence steadily grew. Rocio received her Associate of Arts in Education in 2013. Today, Rocio’s children are thriving. Her oldest son Kevin, 24, just finished an enlistment with the U.S. Marine Corps. Her daughter Kim, 21, is a junior biology major at the University of Texas, Dallas. Emily, 17, is a senior in high school exploring options for college, and her youngest, Heidi, is an 8th grader who loves theatre and is very involved in school. “From my personal experience, I completely see how families can change their fate when they get an education. I have witnessed in my own children how education creates positive change,” she said. Rocio speaking at the 2018 Families Learning Conference. 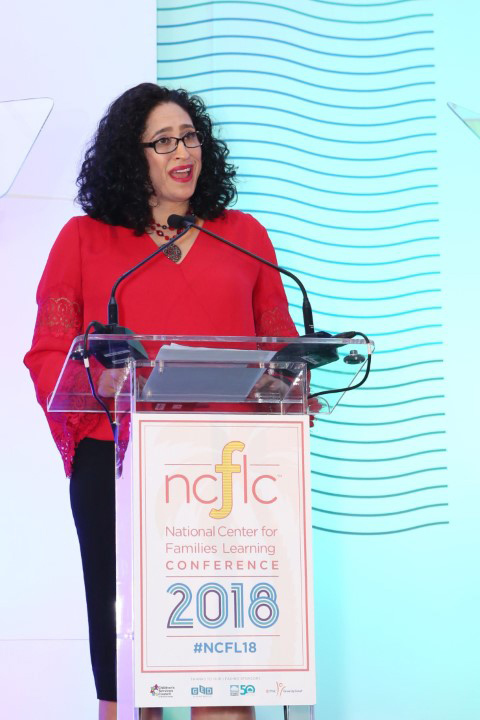 In the fall of 2018, Rocio was invited to share her inspiring journey at NCFL’s annual conference in Fort Lauderdale. As she told her story to a filled ballroom, she reflected on her own journey – from San Jeronimo de Sauces to Dallas to Plano, and to her home-away-from-home at the Plano Family Literacy School.